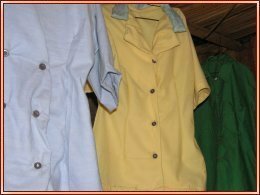 The tailoring course started recently in a small way with a few pupils working in cramped conditions in a hut with a part-time teacher. They have produced some remarkable results, and the trustees were keen to support the development of this tuition for some of the older children with learning difficulties; acquiring a vocational skill might allow them to work independently to earn money in the future. 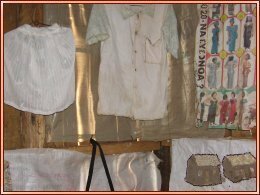 They therefore decided to buy two new sewing machines and also to fund the salary of the seamstress and an assistant from the beginning of May 2007. 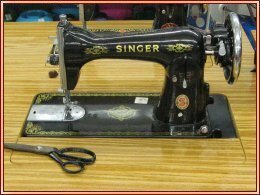 The trustees had decided to fund two new sewing machines, and Tina and Jean were able, during their visit, to purchase these in town. This was quite an operation as the machines had to be unpacked, assembled and placed into position in the stands. 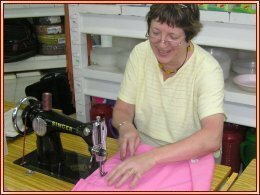 They were tested by one of the shop assistants, and also by Jean and Tina, who were in their element with the old treadle mechanisms. Eventually it is hoped that the charity will be able to supply funds for the construction of a purpose built room. 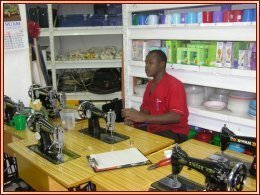 To allow more pupils to be taught at the same time, tailoring classes will be moved to one of the old classrooms, vacated when the new ones come into operation.